Your websites and/or applications have to be accessible always and everywhere, which is why you need your own server. 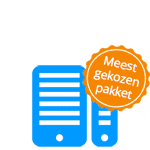 You want this server entirely set up according to your wishes and housed in a Dutch datacenter that meets the highest safety requirements. And moreover you do not want to invest heavily up-front. Internedservices offers you all of this. The Internedservices Cloud Servers are offered in various packages, which can be expanded as needed. You have the choice between Windows and Linux, with or without backup. And you can choose a customized Service Level Agreement. View our packages below. Windows or Linux Cloud Server? You can choose from three operating systems: CentOS, Debian and Ubuntu. Apart from these, Internedservices also offers the paid Linux distribution Red Hat. For Windows Internedservices offers the 2008 and 2012 version. Whether you opt for Windows or Linux, you can always make use of the database option. For Windows, this of course is Microsoft SQL. In the case of Linux, Internedservices offers MySQL. Internedservices recommends clients to always include backup. For this reason backup basis with a 7-day storage period for your data, is so attractively priced. Of course, it is also possible to opt for your own backup. Every client has different needs. We therefore offer different options as to Service Level Agreements. Response time within office hours 4 hours 2 hours 1 hours 30 min. Response time outside office hours n.a. 8 hours 4 hours 45 min.